Bitcoin Cash (BCH) is back with a bang. For sure it is bitcoin that has led the market higher but its 20% leap pales beside the gigantic strides of Bitcoin Cash, 84% the better this past week at $305. In the same way that analysts and investors have been struggling to find a reason to explain the timing of bitcoin’s breakout, so too has the head scratching been in evidence with the price movement of Bitcoin Cash, witnessed in its near-doubling in value since 1 April. The successful launch of the simple ledger protocol for creating tokens on the BCH blockchain has been cited as a catalyst as well as the pop in BCH futures trading on Kraken. Also lending a helping hand may have been bitcoin.travel, which now also accepts BCH, in addition to just bitcoin previously, if you are looking to book a flight with crypto. But that’s hardly enough to explain the stellar price performance of BCH. The bitcoin.travel part is especially unconvincing, given that it also added five other crypto to its roster of accepted cryptocurrency – Ethereum, Litecoin, Dogecoin, Ethereum Classic, and Dash. Ok, if none of that is convincing enough to explain the ongoing pump then perhaps it is the unique mandatory upgrade road map that the BCH dev community has instigated. Bitcoin Cash upgrades every six months, with the next batch of changes due in May. At first brush baking in six-monthly network upgrades seemed something of a gimmick or perhaps an ideologically driven gambit to emphasise BCH’s ease of upgradeability in contrast to the slow pace of development seen in the bitcoin dev community with its notoriously ponderous governance. But it is not likely that the buyers since Monday 1 April were primarily driven by the prospect of software changes such as Schnorr signatures coming to the BCH blockchain, welcome though that is. Certainly, it should be noted that Schnorr is not as insignificant as some would have you believe and is surely another feather in the BCH hat in contradistinction to bitcoin, where Schnorr has been much discussed but failed to arrive, as yet. Schnorr signatures will free up space as SegWit did, but it will also bring into play the ability to make transaction information private. Whereas the old ECDSA (Elliptic Curve Digital Signature Algorithm) signatures required the sender to sign each transaction, with Schnorr aggregation is possible so that just one signature can be used by a bunch of collaborating senders. So Schnorr is most welcome but in and of itself does not explain the 84%% gain either. At the top we said that Bitcoin Cash is back. Well, it is back in the way that the entire market is back, if this is the beginning of a new bull market. But BCH is also back in another perhaps more significant sense. Crypto watchers will recall when BCH had a near-death experience in November 2018. Many will remember that date as the moment when the hard fork of its blockchain triggered the crash in the wider market, pushing bitcoin below $6,000. Bitcoin Cash, itself of course a fork from bitcoin, split into ABC (today known by most of the world as Bitcoin Cash and SV (BSV), and while at first there was a tussle between the two to see which chain would grab the most hash power, a clear winner did eventually emerge. Despite the best efforts of Craig Wright and his nChain team and the dollar muscle of billionaire Calvin Ayre, the direction of travel since January has been clear: BCHABC is the winner. 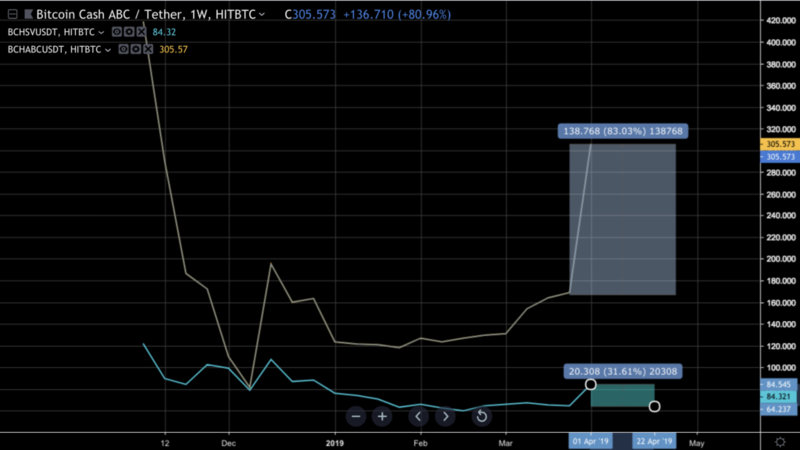 The past week has made that definite, as it left BSV behind in the dust, to currently trade at $305 compared to BCH’s $84. Sure, BSV still made a 30% gain which outperforms bitcoin, but it is a long way behind the 83% appreciation in the BCH price. For those still interested in keeping up with these things, the node count on BSV’s chain is only 438 to BCH’s 821. So pulling ahead decisively ahead of BSV is good for BCH but that was something that, as we said, had been the likely outcome since January, if not before. Then there’s the Asia angle. Ever since the birth of Bitcoin Cash, rooted as it was in the internecine warfare that broke out in the bitcoin development fight over those pushing the SegWit upgrade and the rival camp’s belief that radical scaling solutions were urgently required, which they insisted meant raising the block size – hence the BCH fork. In the BCH camp, outside of the likes of Roger Ver (aka Bitcoin Jesus) and his bitcoin.com site and mining pool, were the Chinese companies such as Bitmain that had come to dominate mining and who it was claimed wanted to make a success of BCH at bitcoin’s expense. Less political observers argued that Asia’s more advanced mobile payments ecosystem was driving the push for BCH with the US consumers lagging behind, still in the habit of handing over their card to a merchant. For crypto enthusiasts in high-tech countries such as South Korea the scaling question at the time was more pressing. The fact that the bitcoin rally began when the Asian market was awake is significant because Bitcoin Cash has for long time been a favourite. The finger behind the three 7,000 BTC algo trades is not known but for our argument that doesn’t matter although the timing points to Asian provenance. As bitcoin jumped, the BCH fans took the opportunity to scream party on, and they put their won, yen and maybe yuan (or BTC) where their mouths were, helping to propel BCH into fifth place in the market cap rankings. All of the above can be brought to bear in the BCH story of the past week, but it is still not enough in this writer’s view to explain the staggering near-doubling in value. There is something altogether more prosaic at work. Reading the UK Financial Conduct Authority’s interviews with consumers who entered the market in the wild ride to $20,000, we are reminded of one of its key findings – the ignorance of many market participants. Getting skilled up is essential in this space for reasons we do not need to rehearse here. One of the buyers in the FCA survey said she wasn’t aware that you could buy a fraction of a bitcoin and so decided to buy coins with a smaller unit price. This tendency, driven by buying psychology that dictates that it is more palatable to purchase a coin with a smaller unit price, was seen among new consumer entrants in the previous bull market. It seems to be happening again and BCH is a prime candidate for attention. Bitcoin Cash has a high profile because it a top 10 cryptoasset and can exploit the halo effect of the bitcoin brand name. In conclusion then, the source of the momentum behind BCH may in part be influenced by any one or all of the factors already mentioned, but it is the fact that it presented the least friction for potential buyers, priced as it was at $167 as opposed to the $4,150 bitcoin price at the point of take-off. BCH had fallen 98% from its all-time high to low, compared to bitcoin’s smaller 84% drop, which further accentuates the risk-reward proposition. BCH could be starting its parabolic climb ahead of the rest. 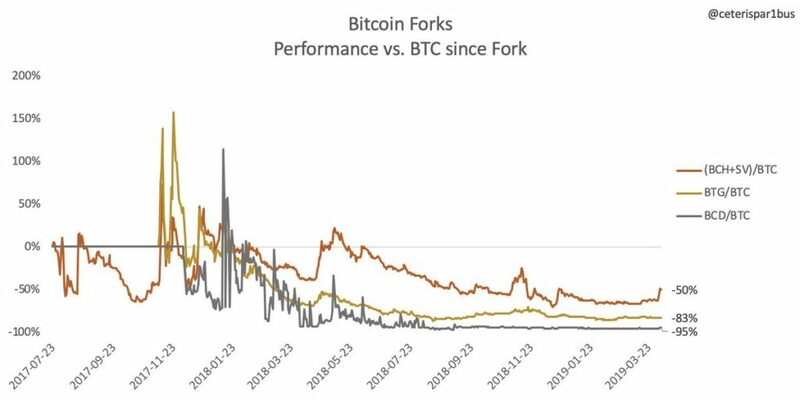 And if you are pondering on how the other bitcoin forks are doing – don’t. The argument of the BTC maximalists that there is really only one bitcoin is still valid. If that’s not enough of a note of caution then the transaction chart for BCH at bitinfocharts might provide some balance. Evidently, there’s not a lot happening on the BCH adoption front – there aren’t many people buying flights with BCH at bitcoin.travel it would appear. Roger Ver of course might say the same for bitcoin.